Kim Wasserman, executive director of Little Village Environmental Justice Organization. Though a sixth-grade sit-in betrayed her activist roots, Kimberly Wasserman Nieto never planned to be a community organizer like her parents. Wasserman, who is executive director of the Little Village Environmental Justice Organization (LVEJO), won the prestigious Goldman Environmental Prize Monday. 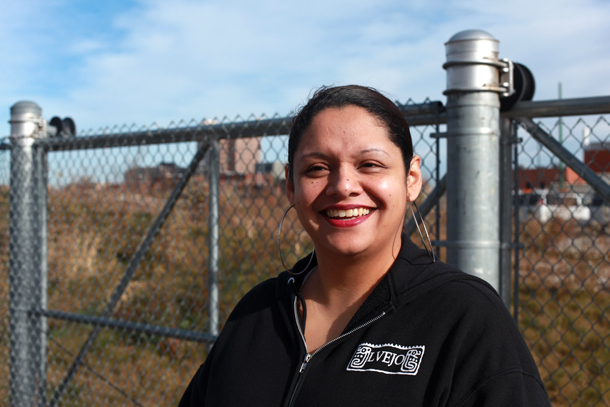 The 36-year-old Little Village resident led the charge to close Midwest Generation’s Crawford coal plant in her neighborhood and the Fisk power plant in Pilsen. LVEJO’s success has been recognized worldwide, but the attention has only sharpened Wasserman’s focus on environmental justice at home in Chicago. Chris Bentley: You first became concerned about the health impacts of living near coal power plants when your young son suffered his first asthma attack, around the same time you started at LVEJO. How did you make the leap to organizing around the issue? Kim Wasserman: The reason I got into organizing with LVEJO was simply because my son had just been born and I didn’t like leaving him at home everyday with a babysitter or in childcare. LVEJO let me bring him with me. So I was knocking on people’s doors, hearing a lot of folks talk about having asthma and their kids having asthma. I went through my scare with my son of him having his asthma attack, and it just kind of all came together at the same time. Was asthma, air quality, pollution — were they common concerns in Little Village at the time? It didn’t register with a lot of people. People just said, “Well it is what it is.” Nobody really put it together as, “Why is this happening in our neighborhood?” We would talk to community members, but it wasn’t like at the very first visit they would give their entire life history. We would ask them, “What kind of health issues do you have in your home?” And they would say, oh my kid has asthma or my grandmother has respiratory issues. We started to realize a lot of families had these problems. After the first year we started to share our results with community members. That’s when we realized a lot of people didn’t even know how you get asthma. They didn’t understand triggers, or how a hot, humid day can impact them. So we spent a lot of time educating people about the basics of asthma. The next year the Harvard School of Public Health report came out. People were livid. They said, “What? Where? What do we do?” That report really catapulted the campaign forward. They didn’t know there were coal plants down the street? They didn’t. The smokestacks put out white smoke, so kids referred to the coal plants as the “cloud factory.” From the street, it doesn’t look like it’s going to hurt you. It’s not until you drive in that you see the coal mounds. Little Village is still in an industrial corridor. Are you concerned about air quality even without the coal plants? We’re waiting a full year to study the data, and we are really are excited to see if there was a drop and, if so, how much. We recognize there’s other industry in the neighborhood, but the coal plants were the largest single source of pollution. This definitely sent a message to a lot of the other industry in the neighborhood to make sure they’re running their business to the best of their abilities. With the redevelopment of the coal plant site we recognize there’s a need for jobs. So we want to be inclusive of local industry. We don’t want to be seen just as shutters-down of industry. We want to engage and understand how we can work together. Is industry part of the neighborhood’s culture, and how do you reconcile the two? It was interesting, right after the coal plant shut down we got a lot of calls from local industry asking what was next. The coal plant was a very different situation. Really nobody in our neighborhood worked there, but we’ve worked with industries where 99 percent of their workers come from Little Village, like the local waste sorting facility. It’s actually next door to the power plant. They were running their facility 24/7, and we had a huge garbage problem. We left it in the hands of the community members, who voted on how to deal with this issue. Do we get rid of third shift? Do we make them retrofit? We then engaged those workers who were working third shift and said, “We recognize we’re basically putting you out of a job. How can we work with you to help you find a new job?” We were able to employ 95 percent of them elsewhere in the neighborhood. There’s room for real engagement, especially now with all the talk about green jobs. We need to talk about how we are protecting the health of the workers and the community. What did your friends and family think of the coal plants when you were growing up? Did you consider yourself an environmentalist growing up? I don’t think I did. Both of my parents were volunteer community organizers. Growing up I made a conscious decision to not get into that line of work. When I was in sixth grade I organized a sit-in at our local grammar school. They were hiring a new principal and the student council wasn’t getting a seat at the table. I thought that was wrong so I organized our school to protest. As a very young child I had parents who taught me if something is wrong, speak up. People are very open to doing the right thing. It’s just a question of working with them. What did your parents think of the award? I had never heard of the Goldman Award before this, to be honest with you, but when I told my dad about it he was beside himself. My parents have been very much a part of my organizing life the past 15 years. To what do you attribute your success? The political process is typically harsh on environmental justice movements. Is that changing? Do you have any lessons or advice? For the first 10 years of this campaign the Daley administration did not want to touch this, for whatever reason. This was also a time when being green was not as popular as it is now, both politically and on a community level. Forming the clean power coalition was instrumental in this process. Bringing in the big green groups was important — our budget and staff is very small. Sierra Club brings an amazing base. How do we make sure to share all the resources they’re bringing are shared equitably? We had to have a lot of tough conversations about class, race, privilege. It needs to be about the mission, not about what organization you’re with. We want to share with others across the country. The shift in administration opened a whole new door. We could make it part of the platform of whoever was running. We were there at every opportunity talking about the issue to get them to publicly acknowledge the problem. I gather this has been a pretty empowering experience for LVEJO. Has that feeling been shared by the rest of Little Village? What else is on your radar? It was very empowering for us. We really want to hold the power plant company responsible to make sure they clean up the site, and that whoever they sell it to uses the guiding principles and plans created up to this point. We’re looking at a new 23-acre park in our neighborhood, as well as an extension of the 31st Street bus to go all the way to the lakefront. We’re going to continue to make the connection to this site and the power that the community has, and how far we’ve been able come in the last 17 years.